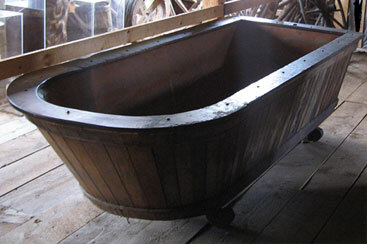 Sutherland Steam Mill produced everything but the kitchen sink ... however they did make bath tubs! Located in Denmark, near Tatamagouche, the mill preserves a time when our forebears were far more self reliant than we are nowadays. In this mill, trees went in one end, and out the other came almost everything you needed to build and beautify your home. Including bathtubs. In the 1890's steam power was the way of the future, and innovators like Alexander Sutherland realized its importance. No longer tied to running water to power a mill, a producer could locate near a transportation source. 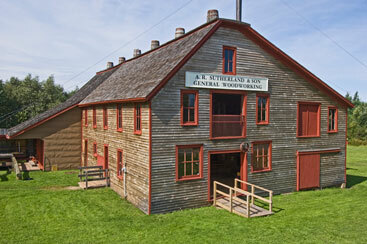 This is exactly what Alexander Sutherland did when built his mill next to the new Pictou-to-Oxford Short line railroad. We have workbenches, shaving horses and hand tools available. If interested call us or drop in.